April 04, 2019: The Board of School Education Haryana (BSEH) usually announces the HBSE 10th Result 2019 as well as the HBSE 12th Result 2019 during the month of May. The BSEH officially conducts the Secondary School Examination (SSE) Class 10 exams during the month of March. You can check your HBSE 10th Result 2019 on this page. This year, the Haryana Class 10 final exams 2019 are supposed to be commencing sometime in the month of March. The tentative date for the commencement of the exams is 08 March, 2019 and it will last till 30 March, 2019, while the HBSE 10th Result 2019 is expected sometime in the month of May, 2019. The official Class 12 exam dates for the academic year 2018-2019 have also been announced by BSEH. The tentative date for the commencement of the exams is 08 March, 2019 and it will last till 30 March, 2019. For regular updates about the HBSE 10th Result 2019, sample papers, Haryana Board SSE Time Table keep visiting this website. Look for the link which says HBSE 10th Result. 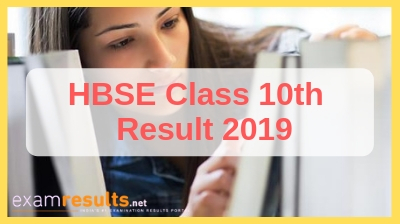 Click on the link and fill in all the details to get your HBSE 10th Result 2019. You can check your HBSE 10th result 2019 from www.examresults.net website along with the official BSEH website- http://www.bseh.org.in/. The Board of School Education Haryana (BSEH) has released the HBSE 10th Date Sheet 2019. The exams will start on 08 March and will continue up to 30 March, 2019. The release of the HBSE 10th Date Sheet 2019 was also confirmed by the board. Furthermore the official circular contains other relevant information which is important for the students who are going to appear for the Secondary School Examinations (SSE) this year. Candidates who have a particular disability will be provided with the services of amanuensis and an extra time of 20 minutes per hour for answering each paper. Candidates are to bring their own logarithmic, trigonometric table and stencils for maps. Usage of colour pencils will be permitted for Science subjects only. Students are advised to go through the official website of the Board of School Education Haryana (BSEH) to gather other important pieces of information before they appear for the exams this year. The time duration for the Secondary School Examination (SSE) Class 10 exams is 3 hours, from 12:30 pm to 03:30 pm according to previous iterations of the HBSE 10th Date Sheet 2019 which is likely to be followed this year too. The time duration for each paper is 3 hours for both SSE and SSCE exams. For more updates on HBSE 10th Date Sheet 2019, keep following this website. The Board of School Education Haryana (abbreviated as BSEH) is a board of school education in the state of Haryana, India. It is the authority which conducts public examinations at middle, matric (secondary or high school level), and senior secondary school (academic & vocational) levels twice a year in the state of Haryana through schools that are affiliated to the board. It was founded on 3 November, 1969 in Chandigarh. The board shifted its headquarters to Bhiwani in the year 1981. The board supervises, organises, controls, regulates and looks after the matters associated with school education in the state of Haryana. The BSEH is unique from other educational boards in India in the terms of the way it conducts the examinations. It was the first educational board in India to adopt the semester system and also the first board to introduce relative grading. The integral part of the BSEH, Haryana Open School (HOS) conducts on demand examination, annual and supplementary examinations at secondary and senior secondary levels. The main aim of HOS is to provide education to all those who can’t afford formal education due to social, financial and other reasons.